A Birdo Egg from Mario Kart: Double Dash!! Birdo Eggs are projectiles spat from Birdos. They can be plain white, but have also been shown to have pink spots in some appearances. In Super Mario Bros. 2, characters can jump on Birdo Eggs and ride them horizontally through the air until the egg hits a wall or is picked up by the character. In Mario Kart: Double Dash!! the eggs explode upon impact with any surface that is not the race track, releasing three items from inside it. In various video games, the Birdo Egg appears as Birdo's emblem, which is later replaced by her bow. 1.5 Mario Kart: Double Dash!! Birdos and their eggs make their first appearance in the American release of Super Mario Bros. 2 (and in the Japanese-only game, Yume Kōjō: Doki Doki Panic that it is based on). Here, Birdo Eggs are plain white and are spat by Birdo at her adversaries, Mario, Luigi, Princess Toadstool and Toad. In many levels, the only way to damage Birdo is to pick up her eggs and throw them back at her, although sometimes alternatives to these eggs exist, such as Mushroom Blocks. In the remake, Super Mario Advance, in addition to a reappearance of normal Birdo Eggs, a giant variety shot by Robirdo is introduced. Apart from their size, they behave as normal Birdo Eggs: they can cause damage to the protagonists, or be carried and thrown back to do damage. In Super Mario RPG: Legend of the Seven Stars, a Birdo hatches from a giant white egg known as Shelly. Birdo can speak to Mario through the eggshell and requests a battle with him and his partners, and their attacks eventually split the egg open. Now hatched, the Birdo can attack Mario and the others with explosive Eggberts, rather than normal Birdo Eggs. Birdo Eggs next appear in Super Smash Bros. Melee and Super Smash Bros. Ultimate, on the stage Mushroom Kingdom II, which is a representation of Super Mario Bros. 2. Like in that game, Birdo (occasionally appearing from either side of the stage) shoots out the eggs, possibly damaging the fighters. The fighters can grab them to use as projectiles against other combatants. Birdo Eggs appear in Mario Golf: Toadstool Tour, making a cameo in Birdo's best post-hole animations, where she spits them out in celebration. In Mario Kart: Double Dash! 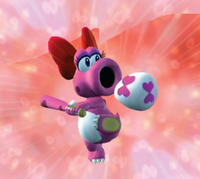 !, Birdo appears as a playable character, and her Special Items are Birdo Eggs. They behave the same as Birdo's counterpart, Yoshi's eggs, but they are covered in pink spots (Yoshi's are green). Once thrown, the eggs home in on the nearest character above Birdo and her racing partner in rank. Upon collision, the Birdo Egg breaks and releases three items at random, and the kart that is hit flips. These items can include Bob-ombs, Stars, Mushrooms, Red or Green Shells, Fake Item Boxes, or Bananas. Birdo Eggs also break if they hit stray items or environmental hazards, and if they go long enough without hitting anything they self-destruct. The eggs are also one of the only two Special Items that King Boo and/or Petey Piranha cannot use, along with Luigi's Green Fireball. In Mario & Luigi: Partners in Time, Birdo Eggs make a brief appearance in the background of Toadwood Forest. In Mario Party DS, a Birdo Egg appears as a card in the minigame Memory Mash. These look the same as in Mario Kart: Double Dash! !, as they are Yoshi Eggs with pink spots instead of green. This is Birdo's only mention in the game. In Mario Super Sluggers, a Birdo Egg appears Birdo's Batting special move Cannon Swing, where she spits an egg with pink bows printed on it instead of the one with the usual pink spots. Then Birdo slams the egg with her bat, so hitting the baseball thrown by the pitcher, which breaks the egg. Meanwhile, the baseball flies at a high speed, hitting the pitcher. In Captain Rainbow, large, pink-spotted Birdo Eggs can be seen mounted on either side of Birdo's House. Birdo Eggs make a cameo in Mario Golf: World Tour as well in Mario Sports Superstars; when Birdo gets a Double Bogey, she hurls eggs at the camera, then one of them bounces back and hits her. 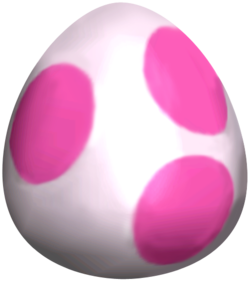 While Birdo Eggs do not appear in Mario Kart DS, an unused kart in the file "KartModelMain.carc" is an Egg 1 kart with pink spots, implying it could have been intended to be used as a Birdo Egg kart. This page was last edited on March 18, 2019, at 13:21.